Who You Gonna Call? CAL FIRE! Cal Fire Captain Eric Ayers of Mattole Station doesn't want another call like the one his crew responded to in July of this year. The victim crawled "quite a ways" along the river bar and then was transported an additional eight miles to the county road before emergency personnel were contacted. He had a severe neck injury and "should not have been moved in the first place." Roughly six hours elapsed between the time of injury and the time first responders were able to treat him. Ayers suspects the victim was involved in some illegal activity, and he doesn't care. Ayers says that many citizens don't seem to understand Cal Fire's role and mission. 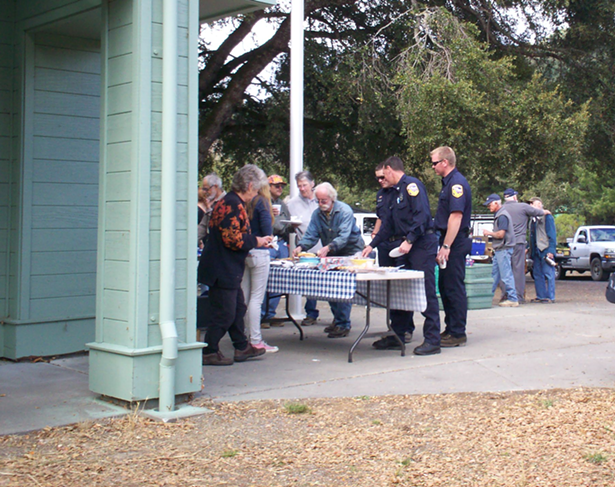 The California Department of Forestry and Fire Protection (Cal Fire) is a state organization with stations in many rural communities, where it often works alongside volunteer fire departments to provide wildland fire suppression and emergency response. According to its official website, "beyond its wildland fire fighting role, Cal Fire answers the call more than 350,000 times for other emergencies each year." "We're first responders," Ayers said. "If you're injured or in danger, we're there to help. We don't care if you have a grow operation going on. Let us help you. The only time we would contact law enforcement is if there was an immediate danger to our personnel, such as an active shooter incident." He adds that in rural communities such as the Mattole helicopter rescue is a vital part of helping those in need get to medical care within what's called "The Golden Hour." If a victim can be in surgery within an hour of injury they have a much better chance of surviving. Cal Fire encourages rural residents to have the GPS coordinates for their property written down to give to dispatchers. Got it? It doesn't matter where you are or what you're doing there: In the case of an emergency, please don't move the victim. Stabilize them, then call 911. Captain Ayers and his colleagues are here to help.